Superman #50 and Batman #50 feature variant covers that connect to form one image, which is what you see here. Madness Games & Comics sponsored these covers, just as they did for my DK3 variant. After the initial sketch I wasn't sure how I would finish it, but as I got into the final I found myself drawing with an almost clinically clean ink line, completely open save for Superman's black hair, and coloring with a vibrant palette. There's probably more than enough darkness out there already, I reckon. 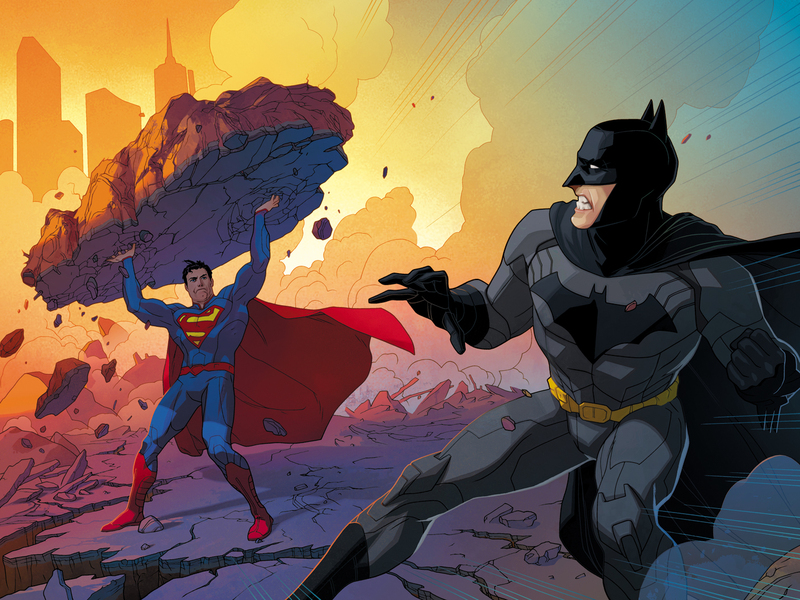 And while I am no expert, I believe a true Superman vs. Batman showdown would end quite quickly with Batman utterly destroyed in seconds, but that may just be my dumb logic speaking.